I had a call last week from a woman who wondered where she could find out if certain homes for sale were approved for FHA financing. As I talked to her about the fact that, for the most part, it takes an appraiser to determine whether or not a home qualifies, I tried to explain what she would need to look for so she could avoid paying for appraisals on property that may not qualify. It occurred to me that there was a good blog post in that explanation so here it goes! FHA appraisers do a different type of appraisal than appraisers for conventional loans. They are more concerned with the health and safety of the borrowers. They look at the standard things that all appraisers look at, and they take it a little further. FHA is not only concerned with the property value but is also concerned with things like handrails on steps, broken windows, lack of screens, evidence of rodent infestation and other issues that don't affect a normal appraisal to the same degree. If the house was built before 1978 and may have the potential for lead based paint, the FHA appraiser looks for peeling paint. The FHA appraiser needs to see that the bedrooms have egress in case of a fire, the windows have to work and if there are burglar bars they need to have the code approved methods of opening them from the inside in case of a fire. They want to see smoke detectors. The FHA appraiser needs to see window screens if there isn't central air conditioning. They look at the remaining life of the roof and the furnace and hot water heaters and want to see a stove in the kitchen. The utilities have to be on during the appraisal and they check that the various components are working. The appraiser looks for evidence of environmental contaminants like asbestos and mold. The FHA appraiser looks for earth to wood contact and other evidence of termites. So for the most part, the home has to be livable. If the carpet can be cleaned or the house needs paint to make it clean and fresh, this will not generally be enough to cause the appraiser to require that the work be done before closing (or after). If you want to read the actual FHA appraisal guidelines you can see an article from HUD here. The basic HUD website can be found here. Deanna and I read the artcle below in the WSJ this weekend. Really it is nothing we already don't know prices are lower and rents are up. It is a great time to buy. More ammunition when talking to your prospective clients'. The good news? Two key measures now suggest it's an excellent time to buy a house, either to live in for the long term or for investment income (but not for a quick flip). First, the nation's ratio of house prices to yearly rents is nearly restored to its prebubble average. Second, when mortgage rates are taken into consideration, houses are the most affordable they have been in decades. Two of the silliest mantras during the real-estate bubble were that a house is the best investment you will ever make and that a renter "throws money down the drain." Whether buying is a better deal than renting isn't a stagnant fact but a changing condition that depends on the relationship between prices and rents, the cost of financing and other factors. But the math is turning in buyers' favor. Stock-oriented folks can think of a house's price/rent ratio as akin to a stock's price/earnings ratio, in that it compares the cost of an asset with the money the asset is capable of generating. For investors, a lower ratio suggests more income for the price. For prospective homeowners, a lower ratio makes owning more attractive than renting, all else equal. Nationwide, the ratio of home prices to yearly rents is 11.3, down from 18.5 at the peak of the bubble, according to Moody's Analytics. The average from 1989 to 2003 was about 10, so valuations aren't quite back to normal. But for most home buyers, mortgage rates are a key determinant of their total costs. Rates are so low now that houses in many markets look like bargains, even if price/rent ratios aren't hitting new lows. The 30-year mortgage rate rose to 4.12% this week from a record low of 3.94% last week, Freddie Mac said Thursday. (The rates assume 0.8% in prepaid interest, or "points.") The latest rate is still less than half the average since 1971. As a result, house payments are more affordable than they have been in decades. The National Association of Realtors Housing Affordability Index hit 183.7 in August, near its record high in data going back to 1970. The index's historic average is roughly 120. A reading of 100 would mean that a median-income family with a 20% down payment can afford a mortgage on a median-price home. So today's buyers can afford handsome houses--but prudent ones might opt for moderate houses with skimpy payments. For example, the median home in the greater Phoenix market, including houses, condos and co-ops, costs $121,700, according to Zillow.com. With a 20% down payment and a 4.12% mortgage rate, a buyer's monthly payment would be about $470. Rent for a comparable house would be more than $1,100 a month, according to data provided by Zillow.com. Of course, all of this assumes mortgages are available--no given now that lending standards have tightened. But long-term data on down payments and credit scores suggest conditions are more normal than many buyers think, according to Stan Humphries, chief economist at Zillow. "If you have good credit, a job and a down payment, you can get a mortgage," Mr. Humphries says. "There's more paperwork and scrutiny than five years ago, but things are pretty much like they were in the '80s and '90s." Not all housing markets are bargains. Mr. Humphries says Zillow has developed a new price/rent ratio that uses estimates for each individual property rather than city medians, to better reflect the choices facing typical buyers. A fresh look at the numbers suggests Detroit and Miami are plenty cheap for buyers, with price/rent ratios of 5.6 and 7.7, respectively. 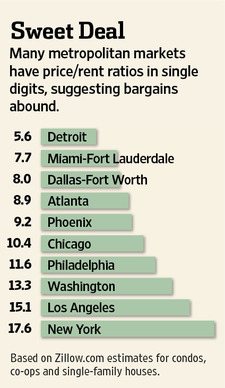 New York and San Francisco are more expensive, with ratios of 17.6 and 17.2, respectively. The median ratio for 169 markets is 10.7. For investors seeking income, one back-of-the-envelope way of seeing how these numbers stack up against yields for other assets is to divide 1 by the price/rent ratio, resulting in a rent "yield." The median market's rent yield is 9.3% and Detroit's is 17.9%. Investors would then subtract for taxes, insurance, upkeep and other expenses--costs that vary widely. But suppose total costs were 4% of the purchase price. That would still leave a 5.3% rent yield in the typical market. With the 10-year Treasury yield at 2.2% and the Standard & Poor's 500-stock index carrying a dividend yield of 2.1%, rents for residential housing in many markets look attractive. A few caveats are in order. First, not all transactions are average ones. Even in low-priced markets, buyers should shop carefully. Second, prices could fall further. Celia Chen, a senior director at Moody's Analytics, expects prices to drop 3% before bottoming early next year and rising slowly thereafter. "If the economy slips back into recession, however, we could easily see a 10% drop," Ms. Chen says. And property "flipping" can be dangerous even when prices are rising. That is because, absent a real-estate boom, house price gains simply aren't that exciting. Research by Yale economist Robert Shiller suggests houses more or less track the rate of inflation over long time periods. Houses aren't the magic wealth creators they were made out to be during the bubble. But when prices are low, loans are cheap and plump investment yields are scarce, buyers should jump. New American Mortgage is a top provider of reverse mortgages in the US. I thought today may be a good time to outline more about reverse mortgages. Reverse mortgages are gaining popularity for Seniors buying homes as well; reverse mortgages are just like a FHA purchase when writing a contract. A reverse mortgage is a loan for senior homeowners that use a portion of the home's equity as collateral. In exchange they can either get cash and/or payoff their mortgage and will have no future Principle and Interest payment. The loan does not have to be repaid until the last surviving homeowner permanently moves out of the property or passes away. At that time, the estate has 6-12 months to repay the balance of the reverse mortgage or sell the home to pay off the balance. All remaining equity is inherited by the estate. The estate is not personally liable if the home sells for less than the balance of the reverse mortgage. To be eligible for a HECM reverse mortgage, the Federal Housing Administration (FHA) requires that all homeowners be at least age 62. The home can be owned free and clear or be such the reverse mortgage will pay off the existing mortgages on the home (there must be significant equity). If there is a mortgage balance, it can be paid off completely with the proceeds of the reverse mortgage loan at the closing. New reverse mortgage regulations are being introduced to make sure the borrower will be able to make the insurance and tax payments on their home. Additionally; new rules are being put in place to make sure the reverse mortgage recipient will be able to keep maintenance on the home as well. Credit scores will be evaluated and income documentation will be required moving forward. Almost all home types are eligible. Condos must be FHA approved in order to be eligible. Generally a home equity loan, a second mortgage, or a home equity line of credit (HELOC) has strict requirements for income and creditworthiness. Also, with other traditional loans the homeowner must still make monthly payments to repay the loans. Typically a reverse mortgage has no income or credit score requirements and instead of making monthly payments to the lender, the homeowner receives from the lender. With a reverse mortgage the amount that can be borrowed is determined by an FHA formula that considers age, the current interest rate, and the appraised value of the home. The more valuable the home (up to a certain point), the higher the loan amount will be, depending on lending limits. As stated previously, with traditional loans the homeowner is still required to make monthly payments, but with a reverse mortgage the loan is typically not due as long as the homeowner lives in the home. With a reverse mortgage no monthly payments are due; however the homeowner is still responsible for real estate taxes, insurance, and maintenance. A reverse mortgage cannot be outlived. As long as at least one homeowner lives in the home as their primary residence and maintains the home in accordance with FHA requirements (keeping taxes and insurance current) the loan does will not become due. In the event of death or in the event that the home ceases to be the primary residence for more than 12 months, the homeowner's estate can choose to repay the reverse mortgage or put the home up for sale. If the equity in the home is higher than the balance of the loan, the remaining equity belongs to the estate. If the sale of the home is not enough to pay off the reverse mortgage, the lender takes over the house in a "non-recourse" event. All other assets in the estate are kept separate from the house and any shortage to repay the loan is the mortgage holder's responsibility. If the estate has $100,000 in IRA funds left over and the mortgage is short $20,000 the estate would ignore the negative $20,000 and get to keep the $100,000. The amount that is available generally depends on four factors: age (older is better), current interest rate, appraised value of the home and government imposed lending limits. We can help determine your qualifying amount. The actual appraisal will determine the final amount. We can run scenarios for anyone interested.